(The winners of this pattern giveaway are Marisa and Brandi. Watch your inbox for copies of the pattern soon). One of the cool things about being a blogger is that sometimes people email me their patterns to try out for free. The owner of this Esty shop had previously been designing doll patterns and asked me if I would like to try her debut dress pattern, The Playdate Dress. What sets this dress apart from other peasant dresses I've sewn is the neck, arm and hemline finishing. Turning under the neck of a peasant dress can result in frustrating bunching; this designer cleverly has you fold and press all the seams under before you start constructing the garment. When you sew all the pieces together, everything is aligned and there are no raw edges to fuss with. I made my dress in classic gingham and eyelet. The pattern gives the option of border or no border at the hem. The pattern is on sale here for $3.00 until May 9th. Feeling lucky? Fun4Me2 is giving away two copies of this pdf pattern to two readers. Simply leave a comment here to be entered to win. Giveaway closes May 10th. Please be sure that you leave an email address if your address is not accessible in your profile. So cool! And I love the fabrics you used. Would love to give it a try, thanks for the giveaway! cute! I've been looking for an easier way to do peasant dresses! How cute!!!! Count me in! Very cute dress! Would love it! 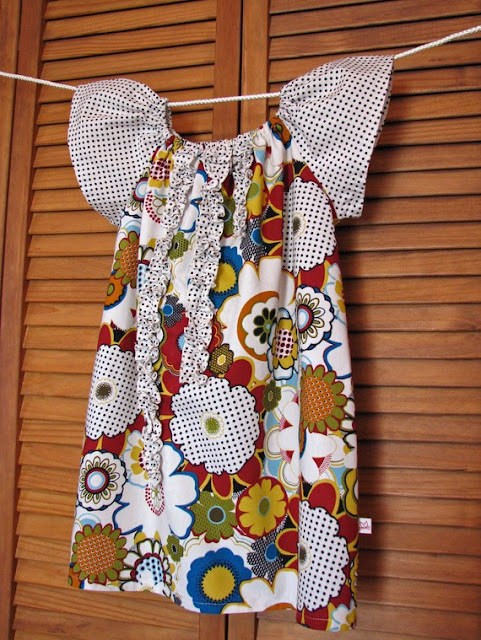 I have two little girls who would LOVE to wear dresses made using this pattern! Such a sweet dress! My little cousin would love it! Thanks for the chance to win. Looks not too hard to sew! I went ahead and bought it, who can pass it up for $3. I my name is pulled maybe I could get a different pattern. - If not, I will enjoy this one. That looks like a good project for me. My daughter loves dresses like that. I hope I win! super cute dress! I would LOVE to win this pattern! Oh I love these patterns, they are always so cute and can be jazzed up so easily. Thank you for the review and the chance to win one. What a perfect little dress for summer. Thanks for the giveaway. Cute dresses! I have 3 girls that would love this! Such cute fabric you used! Perfect summer time dress! Thanks for the giveaway. Fantastic! We have 4 girlies and lots of fabric to play with for this pattern if we win, thanks! This dress is really cute. I hope I win one pattern to make on for my daugther. How cute! I have a little girl who loves dresses. I always love a basic peasant dress. So many possibilities! What a cute dress, and nice that it has sleeves. So many spring dresses are sleeveless. OMG! so cute! i so want to sew that dress!!!! Fun! I would love to win this! Love these! Wonderful - Thanks for the chance! First of all, I love that pattern makers contact you to test their patterns! and second that dress is adorable. At the intro price I am off to purchase it! So cute! I love the embellished ruffle on the front. Thanks for the chance to win! ohmygosh, I have been wanting to make a dress exactly like this (was going to try to figure it out on my own)... I even bought fabric with the dress in mind. eeeeee! I hope I am one of the lucky winners. This would look great on my little girls! Those are really cute! Would love a chance to win. They're precious! Just like my little grand-daughter! I know she'd love to have a couple of these in her closet!! Thanks for the opportunity to win it! Adorable! I'd love to make these for my daughters. Thanks for the giveaway! Really a cute dress. Great pattern! The pink dress is adorable! I want to make one now. So very cute! I am about to have my fifth grand daugther so I can really use this pattern! Thanks for the giveaway opportunity! Cute dress! Oh the possibilities! I would be tickled to win a copy of the pattern to make this cute dress. Oh I love it!!! I am on my first little girl after 3 boys and REALLY want to start dressmaking! (up till now i've done wonders with straight line sewing, curtains, bags, quilts... but can't for the life of me dressmake. I need to start asap and this dress looks a very likely candidate!). How lucky for you that you got to try it. It turned out so cute. It would be great to have a new pattern for summer. I am new at sewing, and this would be a perfect pattern for a first dress. I don't think I could mess it up too much assembling this project. Really cute dress and I'd love to win. Thank you for the opportunity! cute pattern! My 4 YO DD would love it! My sister has a 5 month old baby and basic sewing skills... this might be the right pattern for her! Thanks! Thank you all for such lovely comments about my new pattern, and thank you to Mrs. Dork for posting about it and hosting this giveaway. - I love the pink gingham and eyelet dress!